For last few weeks I keep getting this error (shown below) whenever I am synching my iPad to iTunes library. I tried restarting iPad, synching few times – nothing helped. To understand more, I wanted to see more information on what’s causing this. 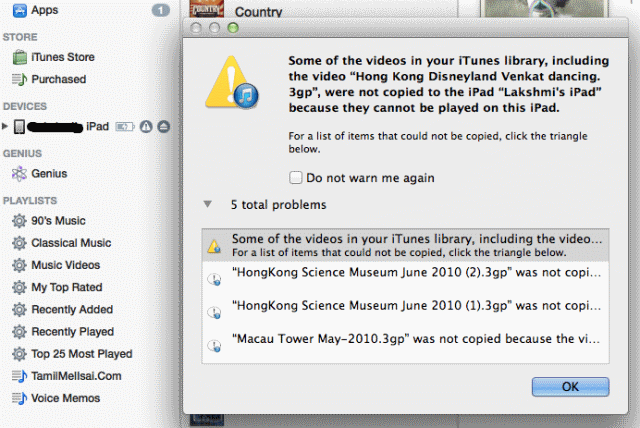 But I couldn’t figure out where in iTunes (as the message asks you to) to look out for the actual error message. After some searching it turns out that you can see the details by clicking on a Triangle icon that appears next your iPad name before the Eject button in iTunes in your OS X. The icon goes away after some time, so you got to be quick. Seeing the details (shown above) it was clear what’s causing the problem. It was the 3GP Video files (taken with some old phone I had that time) that were in my iPhoto collections, which couldn’t get synced to iPad (as it doesn’t support this format). I checked the “Do not warn me again” check box and also turned off “Include Videos” in Photos tab on what gets synced up. While on this subject, if you are using iTunes this Complete Guide to Managing iTunes will be a good read (though it was published in 2011, its the best single article explaining how to segregate content in iTunes).